Description: Avocets are waders with bold black and white markings. They have a black cap and black patches on the wings and back. Their bills are long and up-turned and they have long bluish legs and dark brown eyes. Male and female avocets are similar but the female's bill is shorter and more curved. Juveniles are similar to adults but with more greyish tones. Nesting: Avocets nest in colonies of about 150 pairs. The nest is built by both sexes on mud or sparse vegetation. It is made of stems, roots and leaves from marsh vegetation. Avocets lay 3-4 pale buff eggs with black markings between mid-April and late June. Incubation is 23-25 days and the young can leave the nest and feed themselves within a few hours of hatching. They fledge at about 35-42 days but will remain dependent on their parents for some time afterwards. 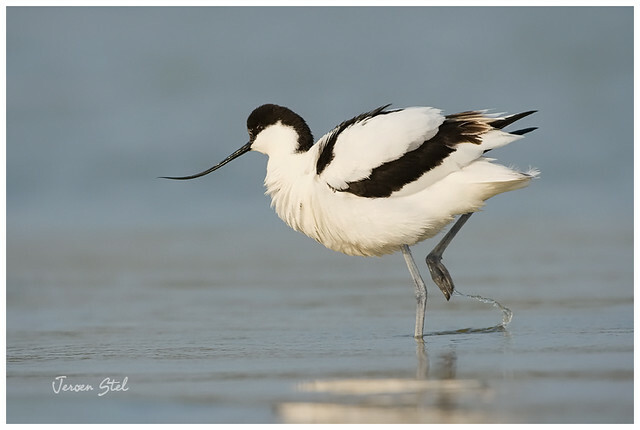 Feeding: Avocets' diet consists of invertebrates such as crustaceans, worms and insects. They feed in the shallow water of lagoons either by picking prey from the surface or using their bills to sweep through loose sediment. Where to see them: Avocets are found along the east coast of England in the summer and the south-west in the winter. The Exe estuary is a particularly good location to see them. Did you know? The RSPB first used the avocet as a symbol in 1955 although it was not incorporated into its logo until 1970.